Property 9: Cottage the house in the alley. Property 14: Charming house with large garden and swimming pool from 900 eur to 1800 eur depending on the period. Najac cottage for 2 with beautiful views of the forest, 5 minutes walk from the city center. Property 30: Najac cottage for 2 with beautiful views of the forest, 5 minutes walk from the city center. We totally enjoyed the stay. It's a long and winding road up the mountains to Najac but the trip is totally worth it. The house is old, as well as it's furnitures, but all of them are functional and we have everything we need for a comfortable stay. The house is just next to the castle and is one of the important historical buildings in Najac. We owner's friend Stephane is very helpful and showed us around the town. He also gave us a lot of useful recommendations of places to see. Thank you very much! Right from the moment we arrived, we were made to feel so welcome and have been looked after superbly by Andy and Dawn for whom nothing was too much trouble. 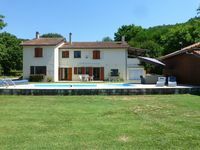 The gite is wonderfully homely and superbly equipped - together with the patio, garden space and of course the pool. The location - secluded but only minutes from town, with all of its amenities, cafes restaurants and markets - is absolutely ideal. It's been a truly memorable holiday and we&rsquo;ve recommended the gite to our friends and family since our return. Look forward to returning next year!